Even though I'm still in the process of designing updated planners for 2014, I wanted to get this new product up ASAP! I know some of you are, like me, in the midst of planning and organizing your homeschool for next year, so I've created a set of printable homeschool planner pages to add to the Plan Your Life Collection. 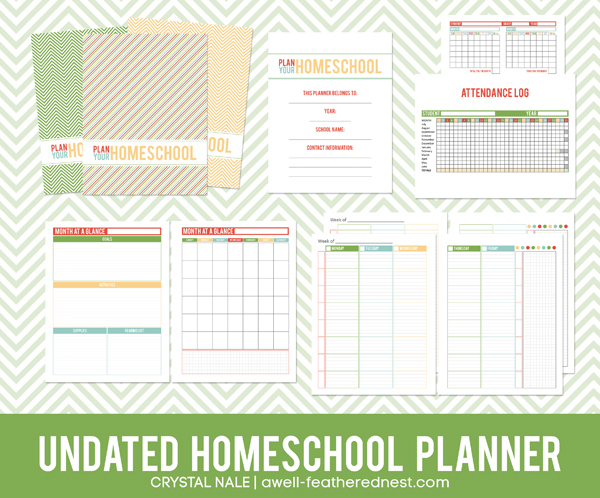 These undated pages can be printed over and over, so you can continue to create a new planner for your homeschool each year. The printed calendars can easily be filled in after you've printed them, and you can add a homeschool section to your master planner, or you can put together a separate planner. This set has been moved to my etsy shop! Including two versions of the weekly planning pages accommodates various approaches to planning, and the spacious, lined boxes will help you to contain your plans neatly. My goal for having 2014 planners ready is August September 1st. As I am finalizing these designs, I will also be thinking through the best way to make these available to you all. Ages ago, I sold on etsy.com, and I originally didn't sell my planners there because I wanted to provide instant downloads. Earlier this year, Etsy introduced an instant download feature, so I am considering revitalizing my etsy shop and moving everything over. Soooo, there might be big changes in store! do you have a lesson planner page for 2 students? Hi Jenifer! I hope to post some examples in the near future to show how the weekly pages can be adapted for multiple students and different approaches to planning. Thanks for a great looking, colorful planner! thanks for a great-looking, colorful planner! !